which we deliver regularly to our children to keep them safe. If you would like further information the NSPCC website has very useful information for parents and carers. 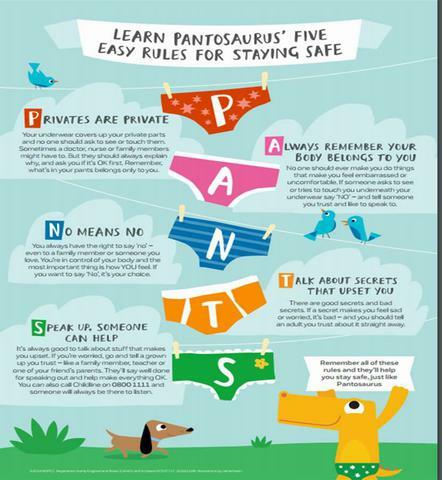 Pantosaurus, the latest instalment of the NSPCC's 'Pants' campaign, is a two-minute short designed to encourage parents to talk to their children about sexual abuse. Created by Aardman, the film enlists the help of animated dinosaurs to explain to children how to stay safe from abuse.